I'm sure you've seen these all over the internet. But I'm late to jump on the wagon. Better late than never, huh? My favorite favorite way to cook vegetables is to roast them with olive oil and salt and pepper. Why wouldn't I have applied this to kale yet? It's a good idea. Yum. Preheat your oven to 350. Whisk oil, salt and pepper, and balsamic together in a bowl. 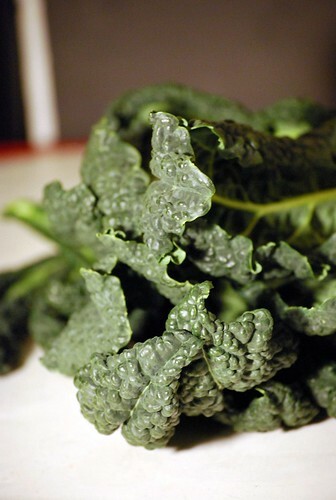 Tear kale into the bowl and toss with the dressing. Bake 12-14 minutes, until crispy. Cool slightly, and try to share. These are tasty, aren't they? I made them for New Years Eve and they were great! Love the addition of balsamic vinegar here, yum! what's funny is that they sell these in a bag pre-made in natural food stores for like $7.99, but so easy and cheap to make. 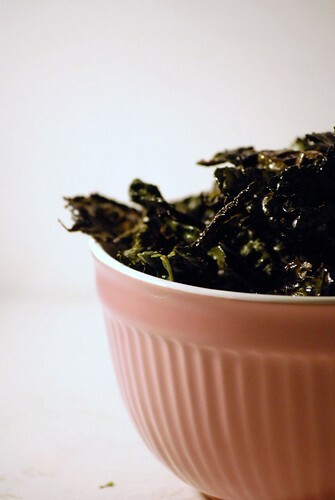 i'm obsessed with baked kale... tastes better than popcorn i tells ya! My husband's only complaint was that I didn't make enough for seconds! Yummy! These are so good, even my vegetable hating son-in-law loves them! i adore these. thanks for posting!